While the Mediterranean is often considered a distinct, unified space, recent scholarship on the early modern history of the sea has suggested that this perspective is essentially a Western one, devised from the vantage point of imperial power that historically patrolled the region’s seas and controlled its ports. By contrast, for the peoples of its southern shores, the Mediterranean was polymorphous, shifting with the economic and seafaring exigencies of the moment. Nonetheless, by the nineteenth century the idea of a monolithic Mediterranean had either been absorbed by or imposed on the populations of the region. 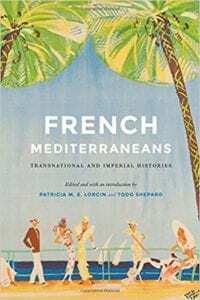 In French Mediterraneans editors Patricia M. E. Lorcin and Todd Shepard offer a collection of scholarship that reveals the important French element in the nineteenth- and twentieth-century creation of the singular Mediterranean. These essays provide a critical study of space and movement through new approaches to think about the maps, migrations, and margins of the sea in the French imperial and transnational context. By reconceptualizing the Mediterranean, this volume illuminates the diversity of connections between places and polities that rarely fit models of nation-state allegiances or preordained geographies.